The house has a footprint of 114 square meters and the whole of the property measures 381 square meters. The house is in perfect condition and ready to move into. The entrance door is to the side of the house. Upon entering, we find a corridor which runs the length of the house. To the right, there is the kitchen with a fireplace and nice wood kitchen units, and including a gas oven, extractor hub and stainless steel sink. The kitchen has a tiled floor and partially tiled walls. Next to the kitchen there is a walk-in pantry with shelves. In this room we have the wooden ladder to the attic. The attic has good standing height and the roof structure is perfectly sound. At the far left corner there is a door to the partially tiled family bathroom. Here we have a bathtub, a toilet, a bidet and a pedestal sink. There are bedrooms, one of which is being used as an office, and a double aspect living room, all with wood parquet floors. The windows of the house are all single glazed, exotic wood framed and in excellent conditions. To the rear of the house, there is a large annex which is currently used as storage and which could be converted into a self contained guest accommodation or a large summer kitchen. There is also a bbq to the rear of the house, and a chicken pen. The garden is all fenced and there is a vehicle access gate to the rear. To the front of the property, there is a pedestal iron gate which leads onto marble stairs to the front porch of the house. 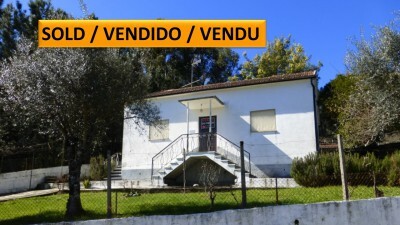 The property is located on a quiet cobble stone lane near to the center of town of Castanheira da Pêra and has good views into the countryside. The property is not overlooked. Castanheira is a council town where all amenities can be found. Main attraction is the “Praia das Rocas”, a wave fun park. There are also a number of peaceful river beaches in the area. The airports of Lisbon and Porto are about the same distance away, some two and a half hours´ drive by car. Both airports are serviced by a number of low cost flight companies.